Will I Ever Be Able to Afford Children? Bringing home a bundle of joy from the hospital is the start of a new adventure. You’re responsible for a new life and are now party to the ups and downs, the laughter and stress, of raising a child. If you plan on having kids, you may already be considering how the new addition to your family will factor in financially. From the cost of health and prenatal care, to childbirth, to actually raising your child—things can get expensive. There’s a crib, maybe a new nursery, diapers, formula, clothes, and that’s just the beginning. Young people are facing unprecedented levels of student loan debt and increasing costs for health care and housing. At the same time, millennial salaries are lower than those of previous generations, partly because many entered the job market after the 2008 recession. While millennials are having kids later than older generations, a majority still rate being a parent as their most important life goal. Don’t worry, with some planning, chances are you will be able to afford to have children at some point in the future. Start by figuring out what costs are involved, how that fits into your budget, and how you can prepare ahead of time. Here’s some of the costs that come with raising a child and tips on how you can save for having a family. The cost of having a baby varies depending on where you live and what kind of lifestyle you envision. The nature of expenses will also evolve over the course of your child’s life, from diapers, to piano lessons, to college. Generally speaking, the cost of having a baby breaks down into two parts. First, there are the “startup costs,” which are those up-front expenses that you typically only need to pay once. Then there are the ongoing monthly expenses, such as child care, clothing, and health care. It makes sense to save for the upfront expenses, but for ongoing costs, you’ll need to make sure you have enough cash flow in your monthly budget to cover them. When you have a baby, especially if it’s your first child, you’ll probably need to purchase quite a few things up front. You’ll have to account for gear like, a car seat, stroller, or carrier. 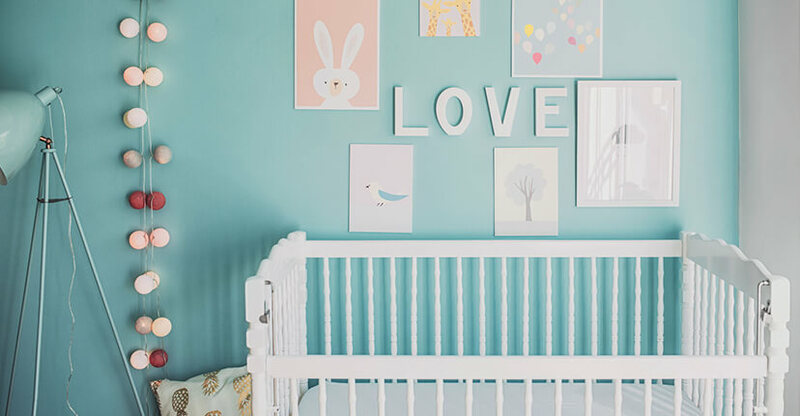 You may need to furnish the nursery with a crib, changing table, rocking chair, and items for feeding, like bottles, formula, a breast pump, or high chair. Plus, you might even need to spend some time and money childproofing your house. How much this all costs will depend on what you decide to buy and where. To call out a few estimates, car seats usually cost at least $50-250 , strollers cost around $400 , and cribs can typically run you from $125 to $350 . An online calculator can help you figure out a customized estimate for baby startup costs based on your situation. Regardless of the amount, you’ll probably want to save up in advance to cover these expenses. According to the latest report available from the U.S. Department of Agriculture, a two-parent, middle-income household can expect to spend between $12,350 and $13,900 a year to raise a child, or $233,610 from the time the kid is born through age 17. Housing is the biggest child-related expense for most people, representing up to one-third of the cost of having a child. The government estimates that two-parent households spend $3,160 to $5,460 a year on housing for a kid (which often means an extra bedroom). Food is the second-largest child-related expense for most families. The cost of food usually goes up as a kid grows from a baby who might be breastfeeding to a hungry teenager. When a baby is less than two years old, households may spend between $1,310 and $2,210 a year on food for their child. By the time the child is 15, that figure is estimated to be between $2,300 and $3,720. Some families don’t incur any child care or education expenses, for example if a family member can stay home with the baby, if they qualify for subsidized child care, or if they send their kids to public school. Of those that do pay, the costs can range from $2,080 to $5,170 a year for children under two. For low-income households, that cost may fall to below $1,000 for older children, while higher-income families may pay as much as $6,270 for older teens, perhaps sending them to private school. Families spend an estimated $1,200 to $3,070 a year on transportation related to raising kids. That includes payments on car loans for that bigger vehicle, gas, auto insurance, public transportation, and flights. Health care costs can range between $820 and $1,820 a year, which includes health insurance premiums and medical and dental expenses not covered by insurance. This estimate also includes prescriptions or medical supplies, as well as mental health services. Clothing , from diapers to sneakers and jeans, costs an estimated $540 and $1,310 a year. You need to know where your money is going today in order to figure out how a child fits in. Track your monthly expenses, with your partner if applicable, in a spreadsheet or app for at least 30 days. At the end of the month, subtract what you spent from your take-home pay. If there’s not enough left over to save or to pay for ongoing child-related costs, you may need to either boost your income or trim expenses. To increase your income, you may consider asking for a raise, refinancing your student loans, or starting a side hustle. For most people, cutting expenses is still necessary. Take a look at your fixed expenses (like rent and utilities) and variable expenses (like travel and eating out). Where can you cut back in order to increase your cash flow? If you learn to live on less today, you can give yourself the chance to save up and make room in your budget for a baby. Before you start saving to have a baby, it’s wise to make sure you’ve built up a general emergency fund of three-to-six months of living expenses. Everyone should have a stash of cash for emergencies, but this becomes even more important when you have a child, since there’s potential for new crises while both income and cash flow might be reduced. Once you have an emergency fund in place, and you’ve calculated the one-time costs associated with having a baby, divide that number by the amount you have available to save each month. The result will clue you in to how many months, or years, away you may be from being able to afford a kid. If it makes sense for you, you can add in all the first-year costs of having a baby (i.e. both startup and ongoing expenses) and aim to save that amount to make the transition as painless as possible. You can also sign up for automated savings with your bank, in which a set amount is transferred from your checking account into savings, to help make sure you prioritize your goal. If your plans to have a child aren’t immediate, it might make sense to invest your funds rather than having them languish in a checking or savings account. You can easily open an investment account with SoFi Invest with as little as $100. By investing in a diverse portfolio of Exchange-Traded Funds (ETFs), you’ll be able to keep costs low while giving your money the chance to grow over time. SoFi advisors will help you come up with an investment strategy that works for you, based on when you plan to have kids and your risk tolerance—free of charge. They’ll also rebalance your portfolio at least once a quarter to make sure it aligns with your goals. Once your child is born, your investment account becomes a great way to continue saving for his or her future, whether for a family trip, prom expenses, or college tuition. Wondering how you’ll afford the cost of raising a child? A SoFi Invest account can help you invest your savings to prepare for a growing family.